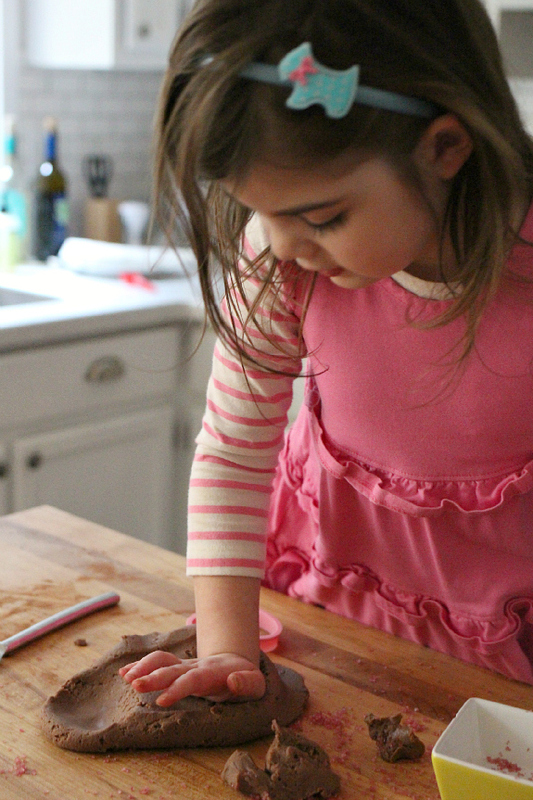 Cooking together is one of my daughter’s absolute favorite activities and the only thing that makes it better is to cook play dough we can play with after! 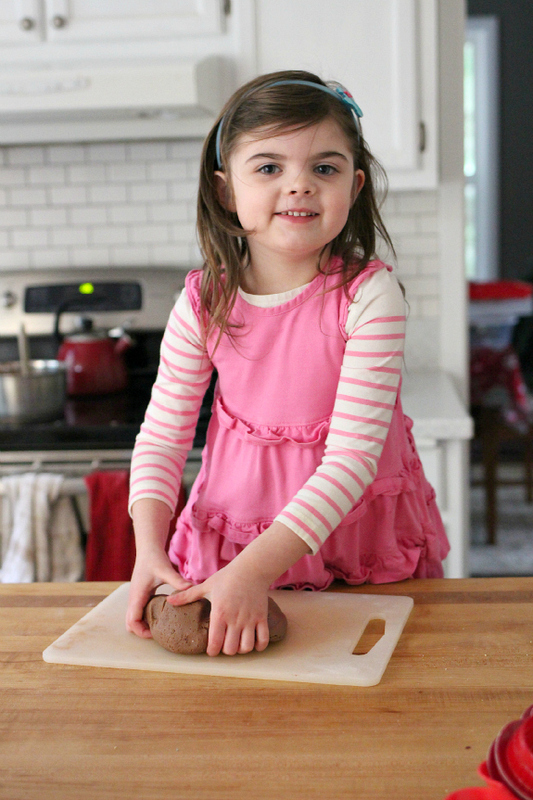 This chocolate gluten free play dough recipe was a bit of an experiment because our tried and true Bisquick play dough recipe needs a microwave and we don’t have one. So we changed it a little and the end result was a yummy smelling, soft, and gluten free. While we don’t have any issues with wheat or gluten many kids do so we wanted to create a fun and easy recipe for everyone. 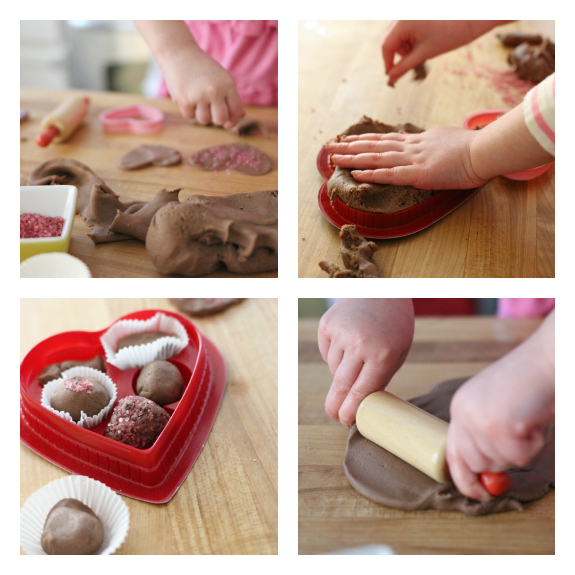 After making the dough play with it – have some fun chocolate themed tools and materials ready to play. Gather your materials. 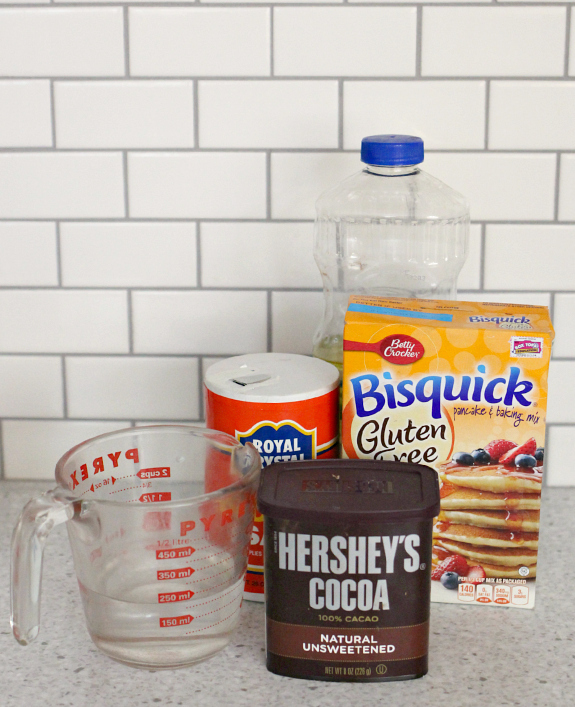 You will need Gluten Free Bisquick, cooking oil, salt, unsweetened cocoa powder, and water. 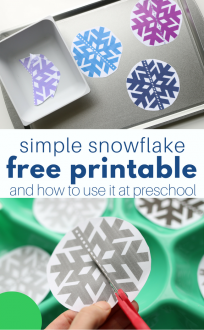 You will also need a cooking pot, spoon, and all your accessories for playing like some mini cupcake liners, sprinkles, a mini rolling pin, cookie cutters, and empty chocolate boxes. 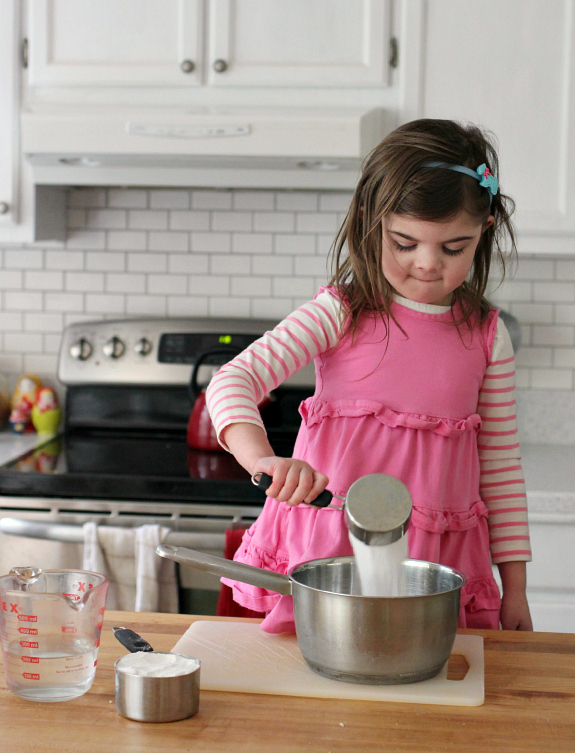 Start by reading the recipe and measuring out the ingredients with your child. I can’t do this AND take her photo so we measured them out together and then she patiently waited for me to scurry around the island and grab my camera. 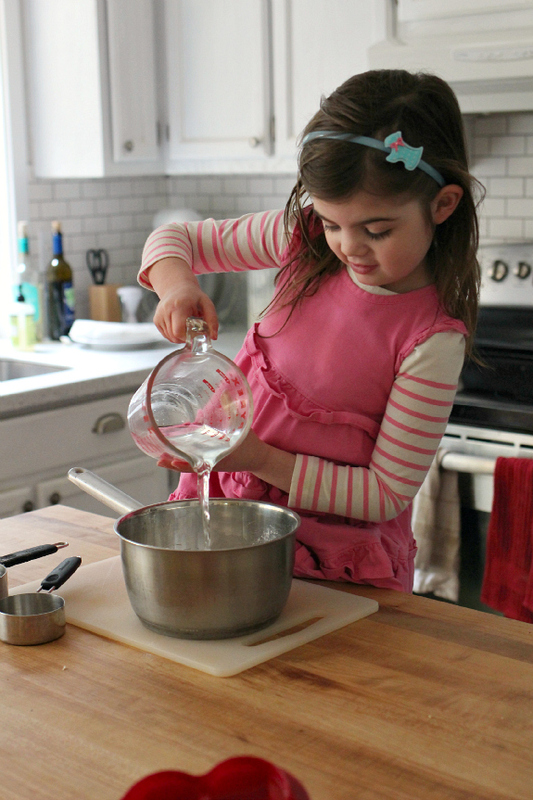 Add the Bisquick, salt, and water together in the pot and let your child mix it until it’s thick. Add in the oil and cocoa powder. Pop it on the stove on medium-low and mix. It’s ready to come off the stove when it forms into a ball. Time to knead it. We added a little more Bisquick and oil as we kneaded it. It smelled SO good! Then it was time to play. She made me some cookies, chocolates for Valentine’s Day, and more with the play dough SHE made. 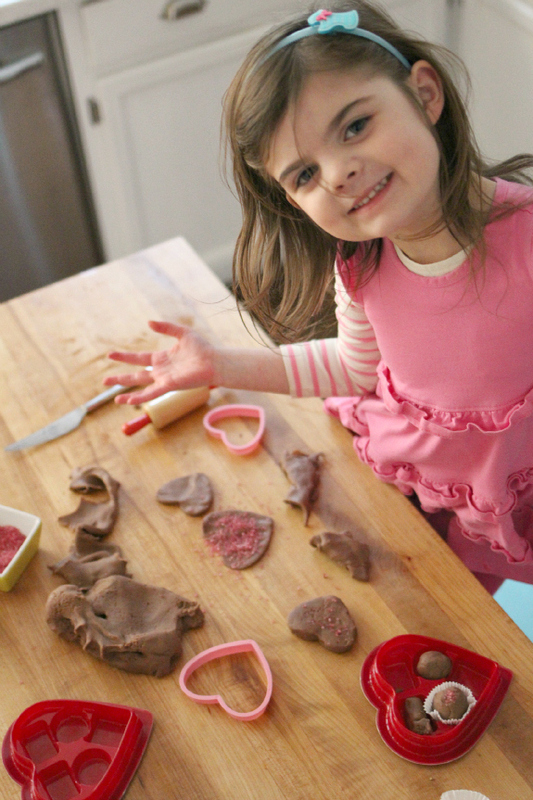 Do you have other play dough options similar to this gluten free play dough that you make with your kids? Share them in comments below or share on my Facebook page! Previous Post: What Do Teachers Do During Free Choice? Gluten sensitivities are normally a digestion issue, so unless you have big plans of eating this dough it’s unnecessary. 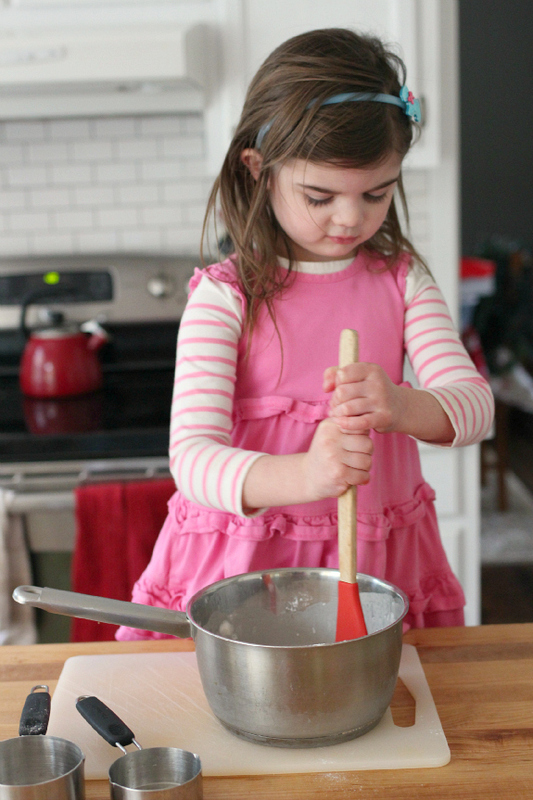 I’m a mom of 5, and I’ve never had issues with kids trying to eat the dough…. it doesn’t exactly taste good. I feel like this recipe is another case of someone trying to gain from the “gluten free” trend. You are right gluten sensitives are usually associated with digestion but contact sensitivities exist, but that is not why I created and posted this recipe. I am asked for gluten free play recipes all the time because some children with wheat allergies are unable to touch classic recipes without rash even if they don’t ingest it. 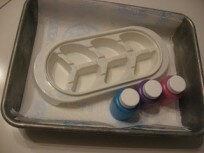 I have had children with wheat allergies unable to use store bought play dough because of this and that is why. This isn’t a marketing gimmick it’s a resource. I just wanted to say that I have celiac disease, my son doesn’t. My son isn’t gluten free but I don’t actually even have wheat flour in the house ever. So this recipe is really helpful to someone like me who has gluten free mixes at home and would prefer not to handle something that even accidental cross contamination could make me sick for a week or two. And just to be clear we are talking about 3 day migraines, unbearable stomach pain not to mention the fact that it messes with my serotonin production so I more or less have about a month of depression issues to deal with afterwards. Anyways, I’m not here to whine about my issues, I just wanted to say thank you for posting this, it IS a good resource for me. As a mother of a daughter that has so many issues with gluten she can’t TOUCH it without breaking out I’m HAPPY to find this recipe! I’ve already shared this with several of my friends that have these issues. 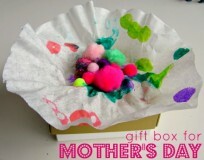 I’m thankful for people that go out of their way to help us mothers that are not creative in finding things. Thank you for helping those of us that need help with gluten free things. You are so welcome Cassie! My son is allergic to wheat. Simply touching something with wheat in it causes him to break out in hives and frequently causes wheezing as well. This recipe is going to be perfect to pass on to his kindergarten teacher for use in the classroom! Also, kids don’t necessarily eat the play dough, but they do frequently touch their eyes, nose, mouth, and other soft tissue areas, which creates an exposure point for those with severe sensitivities. Gluten and wheat protein can also be absorbed through the skin and there are many with allergies and Celiacs who will suffer reactions from even casual contact with gluten. The rise in availability of gluten free options is not a fad for many people. It is vastly helpful in easing the difficulty of living with an allergy or sensitivity. Carrie, Allie is as genuine as they come and cares deeply for her readers. I’m fortunate to know her in person. 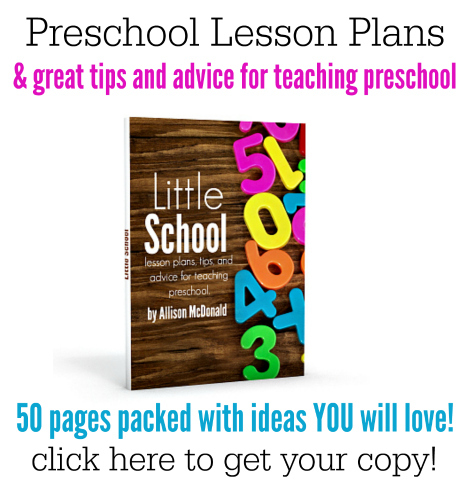 She is a superstar blogger, teacher, and parent. Congrats on being a mom to five. Allie is a mom to tens of thousands. May you find the time to reflect on the impact of your comment and spend more time being kind rather than being spiteful. My son broke out in HIVES after touching flour at age 1 (we didn’t try eating any wheat prior). We ate gluten free and couldn’t have flour in the house. I made my own gluten-free playdough to bring to church or any play-groups so he wouldn’t feel left out. Amazingly, my son, at age 4, tested negative at the allergist and is no longer allergic to gluten. I know that not all little ones will grow out of their allergy, but we are thankful that he did. Thanks for this amazing resource, Allison, what a fun activity idea for the little ones who suffer from gluten intolerance — or for any child who would love to play candy shop. I bet it smells delicious!! However someone with a wheat allergy can definitely have touch- as well as airborn-sensitivity, and I have a gluten-intolerant friend whose hair falls out if she uses skin or hair products containing gluten. My reactions are digestive as well, and I don’t always have the opportunity to thoroughly wash my hands after touching play-doh before I need to prep food or sit for snack on my days at the co-op preschool, and I definitely get sick even from that little contact. My sister has a severe gluten allergy – including contact based – and she has really struggled to find a play dough recipe that her sons can play with that she can touch. I’m excited to send her this recipe! I hope your daughter can use this and have fun! My son who is almost 5 and many kids I know love to taste everything they touch. We did the elimination diets when he was 3 and myself as an adult. It’s easy for people to judge what they don’t necessarily know or experienced. Thanks for this recipe as I will making some for the classroom. It’s just nice to put our left over gf flours to good use regardless of allergies. Will surely be making a variety of scented playdough with this recipe. Thank you again!! Will be sure to tag you if I get a chance for photos. As a pediatric occupational therapist, I have worked with children with Celiac Disease who are so sensitive to gluten that they begin to exhibit a rash even if they touch regular play dough one time — rash all over their neck, chest, and stomach. I have even experienced working with a little child with Celiac whose cognitive function was significantly impacted by gluten exposure. Unfortunately, severe gluten allergies are a real thing. So glad you shared this recipe, Allison, will be pinning and sharing! 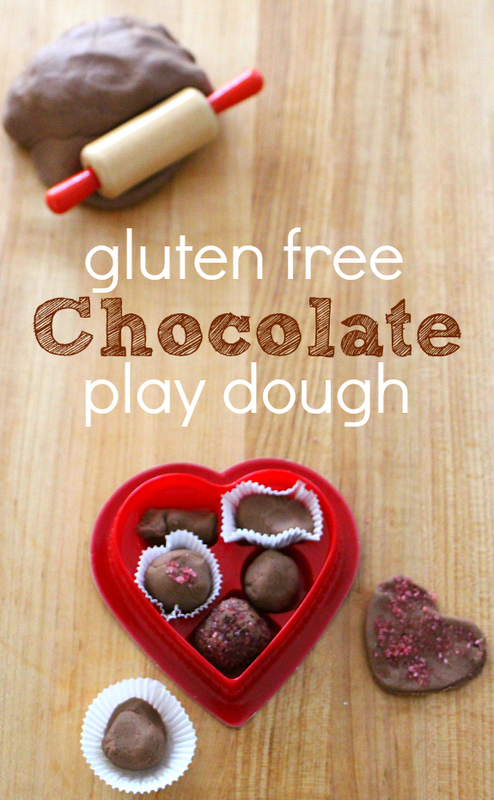 As a parent of a child with severe allergies (we are not a gluten-free family though)… I appreciate that you have shared an allergen free recipe for play dough. When your child has an allergy to something or if it effects them, then the last thing you want to do is let them play with it even if their allergy is only when digested! I absolutely LOVE this!!! Such a fun idea. My SIL is celiac and just like all the comments above, she cannot even touch the stuff. Hey, I have one question about the prep process, it says “pop it in the stove…remove when it forms a ball” Do you mean in the oven or in a pan on the burner? It goes the same for many other allergies. Like egg cartons people can have adverse reactions. For me it can be hit and miss but fresh acidic fruits – just touching it or cutting it up or has been on same plate. Thank you for this recipe! I have Celiac Disease and I’m a mom and pediatric Occupational Therapist. I cannot use regular play doh with my own child or patients I work with because I cannot touch gluten (or use shampoos or lotions with gluten in them). I think your post shows great awareness and sensitivity for those of us with Celiac and food allergies. So thank you! “Most people” isn’t all people – those with the allergy know. I am so glad you stuck to your guns and wrote this recipe for those that need it. TY! Oh I am so happy this will help you out! I’m really excited to do this for Valentine’s Day! How long do doughs like this usually last and what’s the best way to store them? So sorry I missed this – they should last a few months in a cool room in an airtight bag. I have had them last much longer though. If you dont have gluten free Bisquick or even Bisquick, will flour work? Or should I go purchase gluten free Bisquick? Thanks for a great recipe! It will no longer be gluten free if you use flour but it should work, might need a little more salt.